ROAMING SHORES – Discussion over plans for Roaming Shores’ Spring Clean-Up/Expo, maintenance work, the upcoming elections and a yearly meeting at the end of the month were some of the main topics on Thursday, April 4, during the Rome Rock Association’s monthly meeting at the clubhouse. (From April 12 edition). According to Dan Mullins in his operations manager report, the maintenance department has already been taking advantage of the nicer days and has begun by replacing the split rail fence at the entrance of the clubhouse. Additionally, Mullins noted that the association is having the video camera replaced at the boat launch ramp mid-April, as the old system was outdated and did not have live video feed, while noting the new camera will have the ability for real-time video of the marina launch ramp and fob system. He also said he will be working with the Fishing Club for guidance on grass carp as there are conflicting opinions that were given to them about stocking the lake with them. He does have a confirmation email from the Ohio Department of Natural Resources about putting them in. Mullins also reminded residents that the construction road ban is effective until Monday, April 15, so to try to have landscape deliveries postponed until after that. He explained that the RRA ballots must be received in the mail by 1 p.m. on Wednesday, April 24. The annual meeting is Saturday, April 27, at 1 p.m. He noted that the association is accepting applications for summer maintenance help that can be filled out at the association office. In the president/director’s report, Jack McMillin reported that he had attended a two-day meeting at The Ohio Lake Communities Association (OLCA) in Candlewood and included a nice session and conversation about other suppliers in regards to an aqueduct and that he will have more information at the dredging meeting presented about plant life and invasive species of grass crap, along with other ideas that they could start implementing. McMillin also noted that six people not related to the board will be inspecting and counting the ballots at the election. In regards to their treasurer’s report, Louise Lisac noted that their income is down a bit, which is normal for March and that typically April and May bring it up quite a bit. Lisac also reminded everyone that dues must be paid by May 1 and that 550 reminder notices were mailed out thanks to a few that helped with the task. In standing committee reports, Lisac also reported that she and Patricia Wilson having been working hard on collections and have broken it down between lots and names, identified those who can make effective collections and quickly, are trying to keep activity moving on it, noted that no one gets a free ride for not paying and that they have put in specific plans to generate revenue in regards to it. Lisac also announced that they just processed a check from one resident that paid $12,213 for back dues from the resident’s mother but asked if late fees can be removed in which they will decide on later. For building and facilities, Mullins noted that they are waiting on good weather to work on stuff and are looking for a contractor again. For amenities, Pat Swartz brought up the idea of playing pickle ball on one half of the tennis courts. In Lake Management, McMillin said that they have an agreement with Cleveland Parks to do a plant analysis in the lake around June this summer, at no cost to them, and that a group of Tri-C will be analyzing the water to each students data all summer. In Dredging, Rick Brothers announced they would be meeting Saturday, April 6, but have not made decisions but have good activity happening so far. 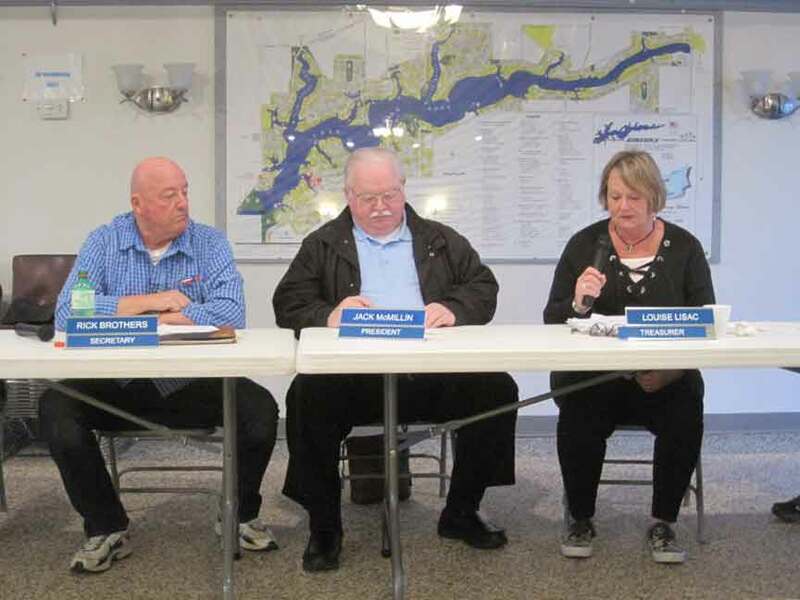 In regards to what’s happening with Roaming Shores Village Council, Bob Cook reported that the lake dam committee is scheduled to meet on Thursday, April 18, at 10 a.m. at the village hall and plan to walk the grounds that day, noted a generator was ordered for 3 East that is coming at the end of the month, while noting that the property has a contract moving forward and plan to put in grass seed. Cook also said that he thinks the old flower bulbs may be available if people want them on the boulevard, noted the dam valve has been closed for two weeks, announced that the village’s 40th anniversary is this year, which they hope to celebrate around the Fourth of July with a suggestion of having a dunk tank or pretend jail cell to raise money at it, along with promotion of it beforehand at the Clean-Up Day/Expo, which Brothers suggested be announced at the annual RRA meeting as well. Cook also noted that the Clean-Up Day/Expo this year is scheduled for Saturday, May 4, in which they will need volunteers for to unload vehicles and in which they hope to remind people to sign-up for the Swift 911 system at. Brothers also requested that they try and ID people this year in some form to prevent outsiders from dropping off items, and McMillin reminded Cook of his idea regarding putting out a sign reminding people to unload their belongings if they can. During special committees, it was noted that STARS is in the works of upcoming events, but nothing in April and are meeting Wednesday, April 10, as well as a note that the Friends and Neighbors are holding their last dinner of the season on Friday, April 12. In regards to the Fishing Committee, it was also reported by Dave Emerick that the club will be meeting Sunday, April 7, to vote in officers, which membership is $20 this year, as well as how they will be discussing putting in grass carp and that if anyone wants to donate toward covering the cost they may be able to match it at the $1,000 mark. The Fishing Club is also trying to figure out a good number of fish that should be donated to the carp fund and announced that the fish will not go in until October. During letters from members, a question from the crowd was asked regarding the idea of a different system on guest cards, as she is only a household of one in which the RRA will discuss further. The March 7th special meeting minutes were approved, along with the treasurer’s report, and the meeting was adjourned. Pictured: Secretary Rick Brothers, President Jack McMillin and Treasurer Louise Lisac go over business on Thursday, April 4, during the Rome Rock Association’s monthly meeting at the Roaming Shores clubhouse.